AWS CloudFormation lets you create, manage, and update a collection of AWS resources (a “stack”) in a controlled, predictable manner. Every day, customers use CloudFormation to perform hundreds of thousands of updates to the stacks that support their production workloads. They define an initial template and then revise it as their requirements change. Consistency – The CloudFormation team works with the AWS teams to make sure that newly added resource models have consistent semantics for creating, updating, and deleting resources. They take care to account for retries, idempotency, and management of related resources such as KMS keys for encrypting EBS or RDS volumes. Stability – In any distributed system, issues related to eventual consistency often arise and must be dealt with. CloudFormation is intimately aware of these issues and automatically waits for any necessary propagation to complete before proceeding. In many cases they work with the service teams to ensure that their APIs and success signals are properly tuned for use with CloudFormation. Uniformity – CloudFormation will choose between in-place updates and resource replacement when you make updates to your stacks. All of this work takes time, and some of it cannot be completely tested until the relevant services have been launched or updated. As I mentioned earlier, many AWS customers use CloudFormation to manage updates to their production stacks. They edit their existing template (or create a new one) and then use CloudFormation’s Update Stack operation to activate the changes. Many of our customers have asked us for additional insight into the changes that CloudFormation is planning to perform when it updates a stack in accord with the more recent template and/or parameter values. They want to be able to preview the changes, verify that they are in line with their expectations, and proceed with the update. 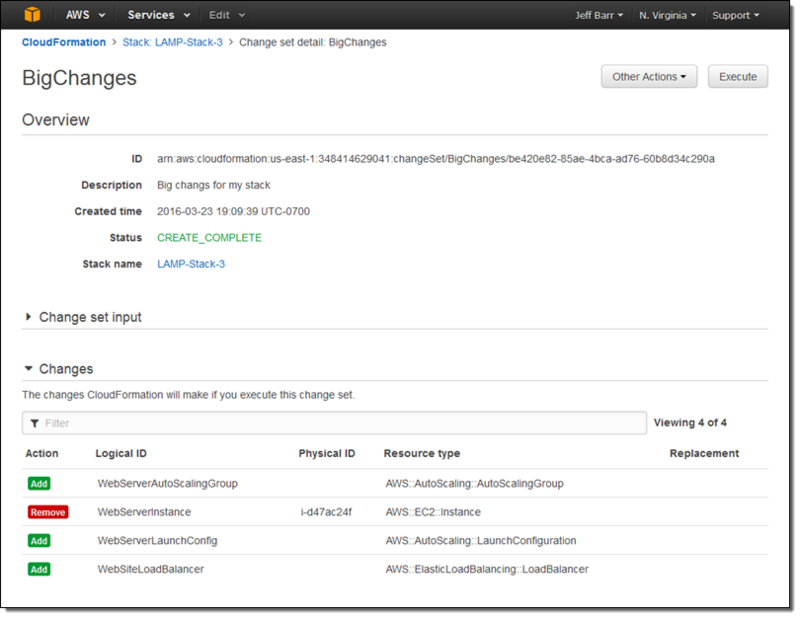 In order to support this important CloudFormation use case, we are introducing the concept of a change set. 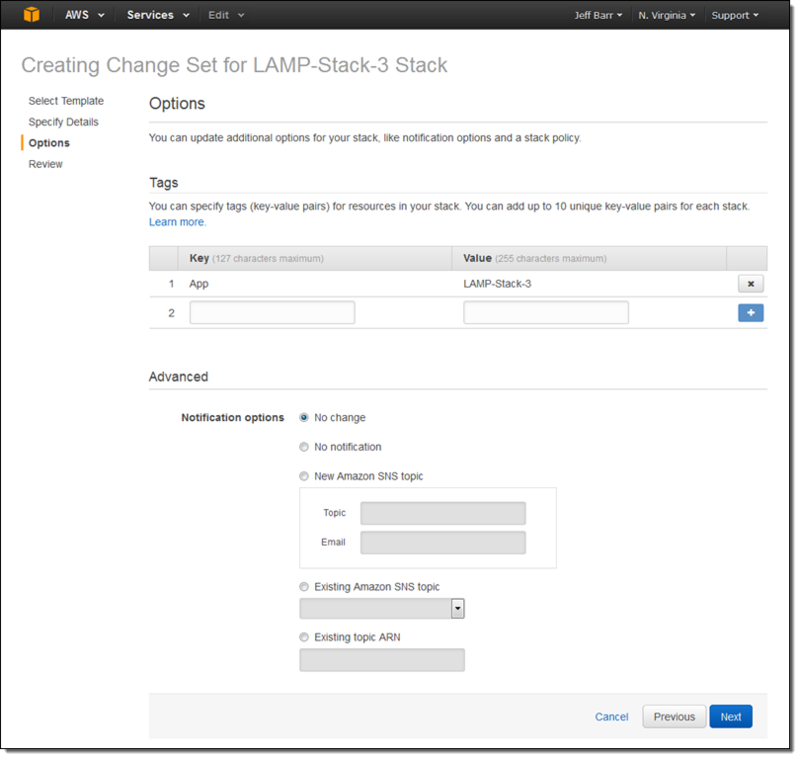 You create a change set by submitting changes against the stack you want to update. CloudFormation compares the stack to the new template and/or parameter values and produces a change set that you can review and then choose to apply (execute). In addition to additional insight into potential changes, this new model also opens the door to additional control over updates. You can use IAM to control access to specific CloudFormation functions such as UpdateStack, CreateChangeSet, DescribeChangeSet, and ExecuteChangeSet. You could allow a large group of developers to create and preview change sets, and restrict execution to a smaller and more experienced group. With some additional automation, you could raise alerts or seek additional approvals for changes to key resources such as database servers or networks. Let’s walk through the steps involved in working with change sets. As usual, you can get to the same functions using the AWS Command Line Interface (CLI), AWS Tools for Windows PowerShell, and the CloudFormation API. Then I uploaded the new template and assigned a name to the change set. If the template made use of parameters, I could have entered values for them at this point. And there you have it! As I mentioned earlier, I can create and inspect multiple change sets before choosing the one that I would like to execute. When I do this, the other change sets are no longer meaningful and are discarded. If a stack update fails, CloudFormation does its best to put things back the way there were before the update. The rollback operation can fail on occasion; in many cases this is due to a change that was made outside of CloudFormation’s purview. We recently launched a new option that gives you additional control over what happens next. To learn more about this option, read Continue Rolling Back an Update for AWS CloudFormation stacks in the UPDATE_ROLLBACK_FAILED state. This functionality is available now and you can start using it today!